Estate planning basics include four essential elements—the will, the revocable living trust, the living will and the durable power of attorney. Just like you can’t build a house from the roof down, you can’t build a good estate plan from the roof down. 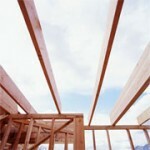 You need to build a foundation of the estate planning basics using the four essential elements first. Think of the wealthy people you know. Does it seem like the wealth just flows to them? Could that be? The answer is yes. The truth is that in every business, those with the most wealth are the ones that don’t have any fear. They have the courage to succeed. Why are they fearless? They have their estate planning basics in place. They have the will, the revocable living trust, the living will and the durable power of attorney set up, and they are on solid footing. To be successful, estate planning basics must be structured using an understanding of the legal strategies associated with wealth accumulation. Unfortunately, many people try to put a will in place but they don’t have a complete picture of how the estate planning basics are used. Others are “taken to the cleaners” by less-than-competent planners and lawyers. These lawyers may give them the will, the revocable living trust, the living will and the durable power of attorney, but then they fail to educate their clients, on how the basic elements work together. Everyone needs a will. Even if you have a revocable living trust, you should have a will. It is the first element of the estate planning basics. The will directs the judge how to distribute your estate after you die. First it will name your personal representative (the executor or executrix). This is the person who will manage your affairs after you die. It is a good idea to name a family member who is geographically near the bulk of your estate, has good business sense, and can be fair with your heirs. You could also name a bank. It is malpractice for your attorney to be named as the personal representative. The will also names the guardian for your minor children. This is so important. It is very sad to see what can happen to children when their parents fail in this first of the estate planning basics. A good will should put restrictions on the guardians. Many wills just have the clause that only reads, “John and Mary guardians to my minor children.” It is so much better to say, “John and Mary; provided they raise the children in the state where the children are living at the time of my death.” Or, “John and Mary; provided they are still happily married and harmoniously living together.” Or, “Grandma and Grandpa; provided they have the health to take care of the kids.” You get the idea. Just because you have a will, that doesn’t mean your estate planning basics are in place. You still need the other three elements. The next is a Revocable Living Trust. The revocable living trust is a powerful element of the estate planning basics. It enables an estate to have a smooth transfer of property by avoiding probate, and also get twice the estate tax exclusion. It can also help provide some anonymity to help avoid lawsuits. You may have heard an attorney say you don’t need a revocable living trust. There is an argument in the legal profession between the standard will and the living trust. I come down in favor of the revocable living trust. 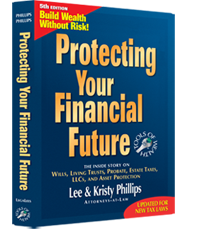 In my book Protecting Your Financial Future, I go through the pros and cons in detail. The bottom line is that a revocable living trust will help you save time, money, and the headache of probate when it is correctly managed. The revocable living trust can have problems—not with the trust, but with the user. The revocable living trust has to be maintained, and it must be correctly funded. It must “own” all of your property. 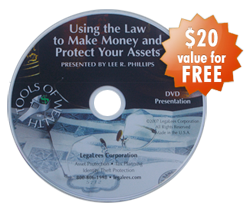 It isn’t hard to manage, but it is seldom that a lawyer takes the time to teach you how to manage your trust. In reality you can’t afford to pay the lawyer to manage it for you. As a result, a majority of people who get a revocable living trust don’t benefit from the trust. The revocable living trust must also “overlap” with a durable power of attorney. If you are putting estate planning basics in place, you need a durable power of attorney. This document allows you to appoint a representative to control your property when you are unable to do it yourself because of incompetency. I have seen people of all ages, not just old people, fall victim to incompetency. This means you don’t wait until you are old to put the durable power of attorney in place. It is true that a revocable living trust should have a provision that lets your successor trustee manage the trust property if you, become incompetent. However that only takes care of trust property. What about your personal and business affairs? The durable power of attorney lets you appoint a representative to manage all of your other business and personal affairs when you can’t do it. The durable power of attorney should be written so your representative cannot just take over. Power shouldn’t transfer from you until the criteria outlined in the document are met, and then there is an automatic transfer of power. Note also that any power of attorney, durable or not, ends immediately if you die. At that point, your living revocable trust becomes irrevocable and your successor trustee and the personal representative in your will take over. The durable power of attorney prevents messy court proceedings required to name a guardian/conservator for an incompetent individual. The emotional and financial drain of such proceedings when a family member has an accident or gets sick is the last thing the family needs. The durable power of attorney prevents all of the legal problems at a time of crisis, when you become incompetent. Your durable power of attorney should also include a section addressing your desires for your health care. This is a durable power of attorney for health care, which allows your “representative” power to interface with the medical industry. With the new HIPAA laws in place, you may not have a hard time getting what you want in a hospital, but it will be very difficult for your spouse or children if you are suddenly unable to direct your own medical care. The durable power of attorney for health care can be part of your durable power of attorney or it can be a separate document. Note this deals only with your medical treatment, not the right to die, which is addressed in another of the estate planning basics—the living will. A living will is the one of the estate planning basics. It directs the doctors to keep you alive or pull the plug. Everyone needs one. The best place to get the document is at your local hospital. Hospitals like their own document rather than the very expensive 30 page document you get from your lawyer. This is because the hospital attorneys wrote the hospital living will document. Hospitals give them away free. They will usually have you sign their living will before you enter the building. Go ahead and do it. That way you can make your choice. These four legal documents form the elements of the estate planning basics that all wealthy people use. They always have these elements in place. They are what I call the “basic tools of wealth.” Start using them today and it will be worth every effort you make and every dime you spend. These tools are described in detail in Protecting Your Financial Future.